Several criteria are used to check the quality of the beaches around the world by the Foundation for Environmental Education (FEE). Our beach is tested year after year and is found suitable for you and your kids. The waters and sand here are crystal clear indeed! 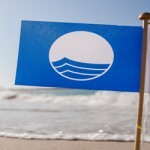 In addition to this, there are 33 tests in total that have to be passed for any beach to receive the “Blue Flag”. Most important of all is safety. We have a lifeguard and health-aid equipment here so that you can relax here without any worries. Please check the following link to the Organization’s website to find out what they say about “Paradisos beach / Marmaras C”.